Miami’s apartment market is expected to grow faster than any other in the U.S., according to analysis by Real Capital Analytics and Costar. The number apartments planned or under construction in the Miami metro is now 18,000 units. That works out to be 10.8 percent of existing inventory, higher than anywhere in America. Many of those units will open soon. By the end of 2018 alone, Miami will see a record number of units come online. Units in existing apartment buildings remain full, with vacancies below the national average. Cap rates for existing buildings in Miami have remained stable over 18 months at 5.7 to 6 percent – well above the average of other gateway cities. Both income and prices have been steadily rising. Can we get some apartment projects in the $1000 a month range for a one bedroom? Especially when we have many jobs here paying just $10 – $12 an hour. They’re plenty but you expect to live in brickell or midtown at $1,000. I pay $1,000 and i’m still close to everything. Um, the Miami metro area is more than just Brickell or Midtown. Dude, they’re building and proposing new apartment projects in Little Havana with one bedrooms costing more that $1000 a month.. so wtf are you talking about? And they’re one bedrooms under $1,000 and you clearly said new so how about you watch your language and stop expecting the government to subside everything and fine these $1,000 apartments like I did. Yep, I can tell you’re a republican.. who said anything about wanting the government to subsidize new apartment buildings? Buddy, if your skillset only commands $10 per hour, a brand new apartment isn’t for you. Rent a used apartment until you can get either skills or experience to command $15 per hour. Save 10% of every paycheck, and dont go into debt. Soon, you can buy a used car. Work on your skillset and get experience and you will earn $20 per hour. At $20 per hour 40 hours per week for 50 weeks and using 33% of your income for housing, you should afford $1,000 per month. Until then, get a roommate or two or three, and stop whining. Um yeah, explain everything you said to the people that come on this site and whine about new condo projects in Miami that the average citizen cannot afford. I thought that I was explaining it. Condo projects that AVERAGE people can’t afford are not in AVERAGE areas, and are not built for AVERAGE buyers, they do not have AVERAGE amenities etc. Not many successful real estate websites get clicks reporting about AVERAGE architects in AVERAGE buildings for AVERAGE joes or citizens. With that mindset the minimum wage should be $20 an hour. If everyone “worked on their skill sets” to make $20 an hour, who would serve your coffee, check you out at retail stores, teach in schools and etc. The fact is their are a lot more residents that make less than $20 an hour and we should be build housing to accommodate them as well. Yes you can find apartments for under $1000 a month but they are rare and mostly slums. MILLENIUNS DONT UNDERSTAND AND DONT WANT TO PRACTICE YOUR ADVICE!!! T?? Yes, but don’t expect them with ocean front views. Shsshhh, where do you people come from. I’m talking about realistic affordable apartments for the average Joe in Miami and you think people are thinking and begging for ocean views? Get real. Yeah so get real and be willing to live in areas that aren’t brickell, downtown or midtown. If its that cheap it won’t be new. Can’t build at those rents. And you tried to and that’s you know? He doesn’t have too. Developers have been complaining to the city for years that they can’t build anything new under a certain $ per sqft with all the codes and regulations. This is old news. And it’s why they are only building lux stuff. For under $1000 you’re going to have to settle for old, small, bad hood or long commute. Probably at least 2 of those 4 so pick which poison you can stand the most. There’s no one here who can help you find that magic unicorn apartment. Rentals in new construction buildings in Doral, such as City Place or Downtown Doral are $1,600+! Thanks guys. I don’t why some people think that new apartment buildings in Midtown or Brickell are the only places that’s charging $1200 and over a month for a one bedroom. I just sold a 20 unit apt building in Ft. Lauderdale ON THE WATER, rents were $900 to $1,100 for the one bedrooms. With pool and parking. It will soon be torn down for a luxury project. It doesn’t pencil out. Construction costs are through the ceiling and land costs are even worse. When you have people trying to sell a single lot in the middle of Little Havana for 300k+, no developer can afford to build units that rent at under $1,000 per month, let alone $1,500 per month. It’s not Brickell or Wynwood, it’s a mediocre neighborhood consisting of mostly T4 where you don’t have to build parking via the exemption and the numbers still don’t work. And you know this because you’re a developer? Well since you’re a developer, can you tell us some of the projects you’ve built and your name? Little Havana isn’t as average as you think. Sure maybe in terms of LOOKS. But the 3 L’s of real estate aren’t ‘looks’ they’re ‘location’. The 3 main job centers in Dade are Doral, Miracle Mile, and Downtown Miami. LH is very close to 2 of them and away from direction of rush hour traffic to get to the third. 1000 will get you a mediocre studio. if you’re making 10-12 an hour and looking at the urban core for housing, you’re in severe need of a reality check. Yeah, you might as well go live in your car or under a bridge somewhere if you’re only making that much. Most jobs in the urban core pay that much, so why is it crazy for them to want to live close to work. especially if they don’t own a car. This is why they should require all new projects to include a percentage of units for workforce/affordable housing. Yes, if you want to live in Hialeah. Remember when your parents told you to study and get good grades so that you could get into a good college and later on have a good career? Welcome to adulthood, life has consequences. Tell that to the students who’s average college debt is around 75 to 120 thousand dollars and above after finishing college. If you decided to study philosophy at a private liberal arts colleges, then you deserve the consequences of your decision. All my friends who studied Finance, engineering, medicine, etc, and who have gone to schools like UF have had no problem with student debt. Again, welcome to adulthood, life has consequences. Um yeah, all your friends make up the entirety of people who went to college. I bet you have way of explaining any and every thing very easily. So now everyone has the choice to go to schools like UF to study Finance, engineering, medicine, etc. Get over yourself I know many people who went to UF and studied all of those things and cant afford to live in any of the new projects being built. maybe in 10-15 years they will if they’re lucky. Good grades don’t always equal big checks. So true, and as Trump always said, the system is rigged, it really, really is, and it still is. Trump’s daughter doesn’t have to worry about student loan debt at Georgetown… the problem is now we have a society where if you play by the rules and take debt to learn a trade, and w/o connections, family money, you are screwed, and won’t be able to afford an apartment in downtown miami. I hear you ‘bro. Unfortunately nothing “new” can be delivered to the market for $1,000/month simply due to the cost of new construction, unless it is the size of a shoe box. At that income level used rentals are your best bet, and there are plenty around, though probably not near the water or within easy reach of 95. There are exceptions of course in some gritty neighborhoods (your squeeze won’t be walking the dog at night). That’s been the American way for a long time – strive to make more money, and immediately blow it on better housing. Would be nice to break the cycle. The CoStar analyst calling the market in Miami is a joke and is consistently wrong. I wonder if they ever leave their Atlanta office to see the market. You’re right, I wonder if they even took a look at the Seattle metro apartment market. True. But the sad part is they have a satellite office in Brickell…a very nice and big one. When you consider how well established an developed other cities are their apartments have been in place for years! 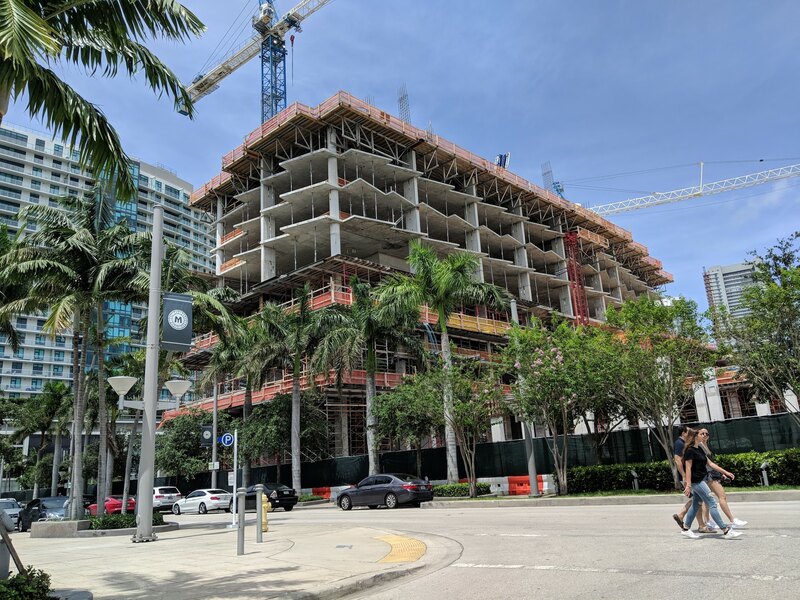 Development in Miami is still growing and still has open lots everywhere while other cities don’t have room to build so they’re building out.so I can see this article being true an we still have a long way to go in comparison. Wow, Gringo is smart.. he knows how to compare paying for a Condo in Brickell to paying rent anywhere else in Miami. Don’t let anyone tell you you’re not a genius Gringo. I think he’s just saying a unit owner can’t afford to rent his/her unit for less than $1,650 w/o incurring a loss, not factoring in mortgage, if any. Did he say that his Condo association allows tenants to rent out their units? Oldest principle in RE. Supply and demand. Vacancies price drops, Occupancy rent increases. precisely, on an overall basis. On the other hand, I suspect there is some migration taking place between markets as renters are choosing to live closer to employment centers, have easier reverse commutes, and empty nesters. Next recession might be telling though. Interesting rosy forecast. I wonder how they account for the shadow rental supply from all the new condos being delivered? They’re plenty of gyms in the area. Only $150-$250 per month gyms for that area. I hope they sell to anybody. I hope they stop selling to Melo so he can stop ruining our skyline.